GDP is the gross domestic product. It represents the total dollar value of all goods and services produced over a specific time period. It is one of the primary indicators used to gauge the health of a countries economy. 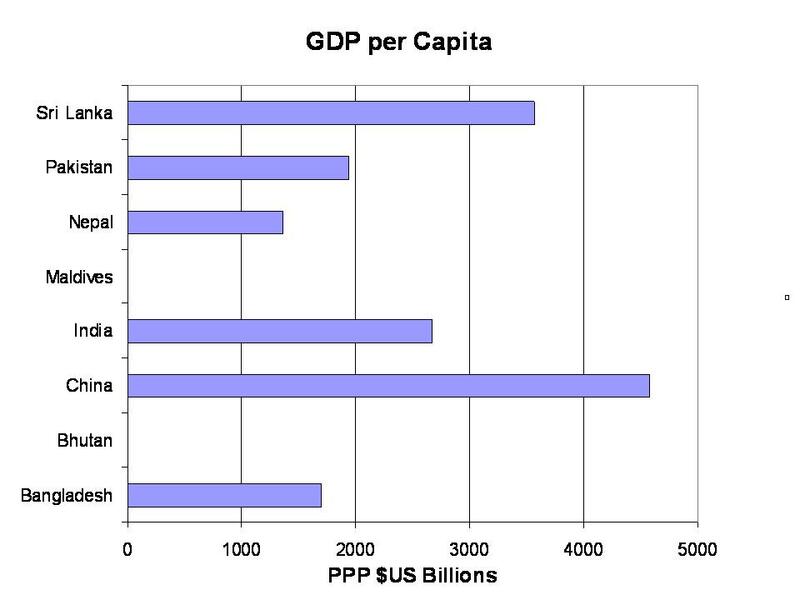 Sri Lanka has the highest GDP per capita in the region, while Afghanistan has the lowest. India is the largest economy in the region (US$ 2.05 trillion) and makes up almost 82% of the South Asian economy; it is the world's 10th largest in nominal terms and 3rd largest by purchasing power adjusted exchange rates(US$ 7.28 trillion). Pakistan has the next largest economy and the 5th highest GDP per capita in the region, followed by Bangladesh and then by Sri Lanka which has the 2nd highest per capita and is the 4th largest economy in the region. According to a World Bank report in 2007, South Asia is the least integrated region in the world; trade between South Asian states is only 2% of the region's combined GDP, compared to 20% in East Asia. The Economist has blamed this on Indian neglect of its neighbors. Poverty is a problem in South Asia due to the population strain on limited land and other resources, and weak economic development caused by faulty government policies and corruption. South Asia has always provided highly contrasting economic images. It is a land of fabulous wealth and of extreme poverty. The subcontinent has a small elite of very wealthy people and a large and growing middle class. South Asia has almost one half of the world’s poor even though it has only 20% of the world’s population. In 1997 the Pakistan-based Human Development Center called the subcontinent the poorest, the most illiterate, the most malnourished, most deprived and the least gender-sensitive in the world. South Asia is the poorest region in the world after Sub-Saharan Africa. According to the poverty data of World Bank, more than 40% of the population in the region lived on less than the International Poverty Line of $1.25 per day in 2005, compared to 50% of the population in Sub-Saharan Africa. There are more poor people in eight Indian states than in the 26 poorest African countries.